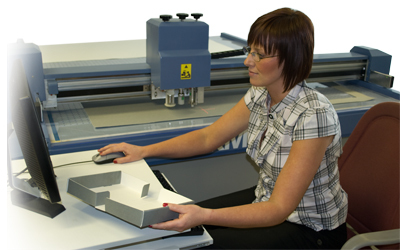 AG/CAD Limited has been supplying libraries and archives with computer controlled box making systems for the past 10 years. We have done this in close co-operation with another English company, Conservation By Design Limited. By writing sophisticated, but easy to use design software that runs on a personal computer with a Windows operating system, our in house programming team has developed software specifically for Archives, with a view to bringing the manufacture of phase boxes and similar enclosures within the grasp of casual computer users and those with little or no knowledge of packaging design. As well as programming, we also maintain a support and training section offering telephone and electronic support to contracted users during normal office hours. Prompt hardware support is provided to customers by our highly skilled and experienced team of field engineers who handle all installations, ongoing maintenance and servicing.